Please feel free to browse our photo album, a collection of photos from various events that take place during our calendar year. When viewing gallery pages, please click the thumbnail images to see a larger version. A GREAT DISPLAY OF VINTAGE MACHINERY IN ACTION, DOING WHAT THEY WERE MADE TO DO..
ANOTHER GREAT DAY IN DURROW WITH TWO CLUB CARS ON THE \"IRISH VINTAGE SCENE STAND\"
A FEW PHOTOS TAKEN BY SOME MEMBERS OF OUR CLUB ON A RECENT TRIP TO "THE GREAT DORSET STEAM FAIR"
Danesfort Field Day and Kilkenny Motor Club, Our "Big One" was a great success due in no small part to the hardwork of Paul, Brian, Declan & Declan and everyone who helped out on the day. Thankfully the morning rain was light and the afternoon opened up nicely. Thanks especially to the Carlow and Abbeyleix Clubs for coming along and bringing so many vehicles. Yet again the Llandudno show was a resounding success, with Saturday and Sunday bringing glorious sunshine and an even bigger show than ever. Though the Autojumble was not as good as in previous years, the members of KMC who travelled over thoroughly enjoyed the weekend. Undoubtedly one of the stars of the show was Owen Mahony's Mighty MINI, simply superb was the universal judgement by all and is a credit to Owen and all who contributed to this project. "Overwhelming" is the only word to describe this years Durrow Classic Show, probably one of the biggest classic shows ever seen in Ireland. Check out these photo's, they are only a tiny sample of what was to be seen. We had a great turnout for our Spring run on Sunday 12th April, we started off with a display in Kilkenny Castle at which we were joined by members of ” The Celtic Old Vehicles Owners Club” from Co. Meath and the surrounding counties, they were in Kilkenny for the weekend. A total of 97 cars were on display with 68 going on the run that followed. 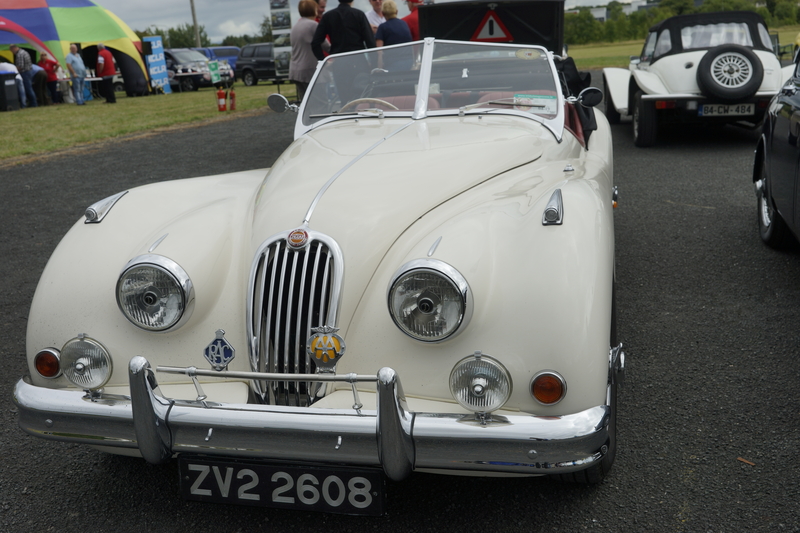 A large attendance turned out to see the array of vintage cars on display at the annual Noel Duggan Memorial Vintage & Classic Car show on Sunday 27 June. There was much to entertain the crowds, with popular group, Fianna, going down a treat. Great show on the main street of Stradbally, Co. laois, with a selection of cars, tractors and some traction engines. The Irish final of “The Rose of Tralee” were held in Portlaoise last weekend and someone came up with the idea of a Parade on the Saturday of the 30 or so “lovely ladies” in Vintage cars. So Ballinakill, The Capri and Kilkenny Clubs were called at short notice to supply the cars and some of our lucky members were able to answered the call………..
A total of 39 cars attended from THE K.M.C. The show was a huge success with a huge crowds attending. There was lots to see and do. Our 2nd annual picnic in the park and yet again we were blessed with a beautiful evening, over 40 club members made the short trip from Kilkenny and enjoyed an evening of chat, some tyre kicking and polishing, not forgetting the welcome cup of tea provided by our very hard working committee, thanks again to everyone. On Sunday May 11th we had a run to Wexford to the Irish Agricultural Museum on the Johnstown Castle Estate. A very interesting place and plenty to see. A total of 24 cars joined us on the day. Thanks to everyone who came. A big thanks to “Jim o Grady ” for photos. Club members recently drove to Kilbeggan in Westmeath and enjoyed a great show. Club members brought 22 car's to Llandudno this year, thanks to everyone who helped make the weekend such a success. The Llandudno Transport Festival is held on the sea-front showground in one of the most picturesque bays of the UK. Llandudno is Wales' largest resort and famed for its Victorian style and Edwardian elegance. With hardly a rut in sight and or a cow pat under foot / wheel, but so, so cold. Well you can't have everything ?. Full compliments to Austin and his hard working crew for a great and very well organised show, everyone enjoyed the huge numbers and the variety of vehicles on display, roll on 2009 ! A great day had by all with over 40 cars and a motorbike ( Thanks Austin ) joining us over the day, it was surprising how many people had not been in both places even when they were local. Thanks to all who turned up and those who helped on the day. St. Patricks Day and our members took to the streets of Graignamanagh and Kilkenny City with a colourful display of vehicles, including our "Keep Ireland Green" themed float, not forgetting our Bishop who granted special dispensations to all Club members to mark the occasion ! A surprise Valentine's Road Run was run on Feb. 17th, starting from our usual meeting point at "Tubs & Tiles" we were off at 11.30, and on through Waterford city and a stop for lunch at "The Halfway House" then on to the Promenade in Tramore, where the cars were greatly admired by the many visitors, later we had a leisurely drive back to Kilkenny after a very pleasant day. January 1st dawned cool and bright but DRY, 27 members and their cars braved the elements and headed off to Rathdowney and Donoghmore on a sponsored Charity run in aid of Sister Muriel of the order of St. Joseph The Worker. To discover more visit (www.saintjosephtheworker.org) then it was on to Kilcotton for tea and sandwiches which were greatly appreciated by everyone, thankfully the rain held off till we were almost home, and a great day was had by all. We had a great day with 124 cars,21 tractors and 5 motorbikes. A great crowd turned up to field day and took a great interest in our displays. Thanks to every one that came and to every on that helped on the day..